Newport Children's Theatre - Donate to our Annual Fund! Donate to our Annual Fund! Please consider donating to our Annual Fund before year-end! 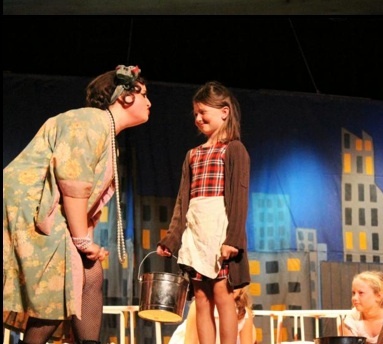 Newport Children's Theatre has been a staple in the Newport Community as a trusted provider of family entertainment and educational performaning arts opportunities for over 30 years! We offer the best possible youth theatre program in the state. Our faculty members whether local or from Broadway have years of experience and top-notch credentials! They continue to develop every year an increasing desire in our children to explore the world of theatre. Our unique program is central to the young actor. We focus on actor specifically between the ages of 8-18, inviting them to discover the creative process involved in theatre arts. People ask from time to time, "why not cast adults? Why not provide classes for adults?" It is our mission to empower the young actor by providing them a platform where they have a voice in their own creative development. Our actors enjoy the chance to play roles that would certainly be cast with adults in community theatre. They have portrayed some of theatre's most iconic roles such as Fagin from Oliver!, Quasimodo from The Hunchback of Notre Dame, Bottom from A Midsummer Night's Dream and Dolly Levi from Hello, Dolly! Our unique blend of young children and teens create a theatre family where each actor in celebrated for exactly who they are and where they are in their development. We need your financial support to continue to offer a place for future children to join our special place filled with music, dance, expression, and support! Copyright 2011 Newport Children's Theatre.